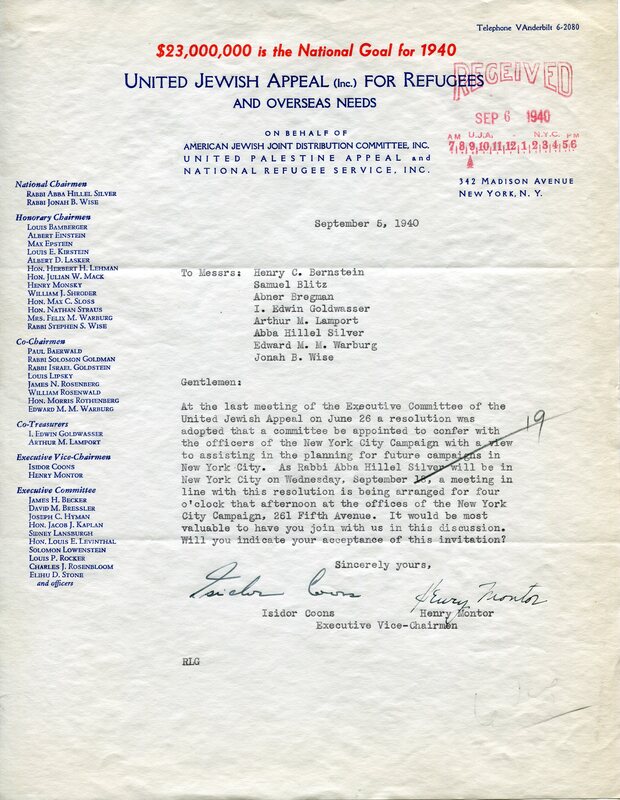 Henry C. Bernstein’s subject files towards the end of his tenure as EVP for UJA include a file labeled, “Appointments” from 1968. In the folder are mainly index cards, which serve as a record of some of the speaking engagements Bernstein was involved with planning that year. 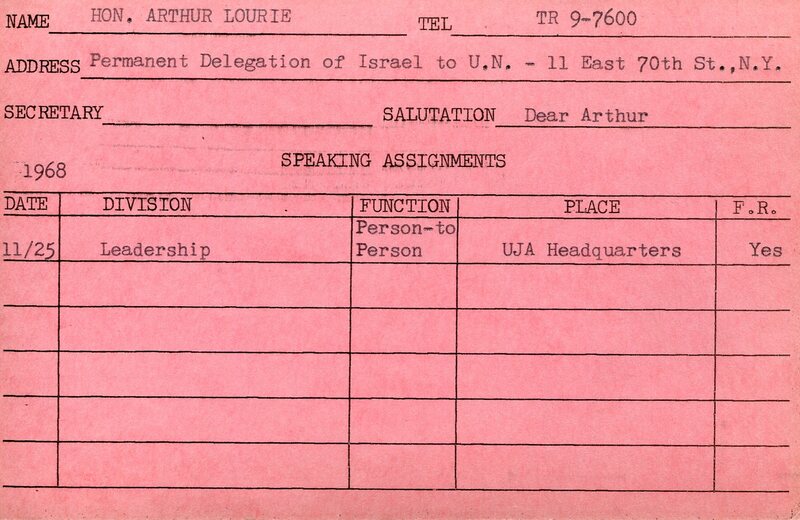 One of the cards is for Arthur Lourie, then a member of the permanent delegation of Israel to the U.N., and interesting to me because he was married to longtime Hadassah Executive Secretary/Executive Director Jeannette Leibel. 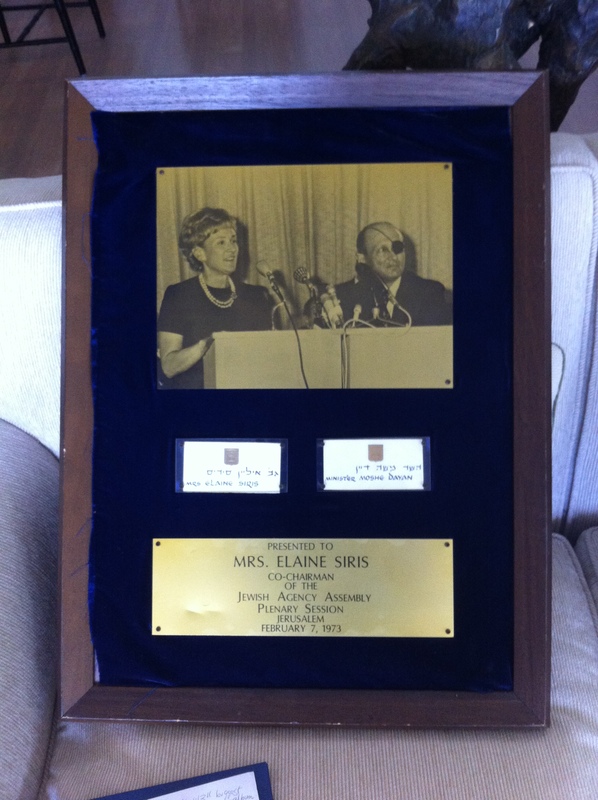 Until Arthur’s duties took him back to Israel and to diplomatic positions in other countries Jeannette remained as the top staff leader at Hadassah in New York. Another speaker that year was then Israeli Ambassador to the United States in Washington, Ambassador Yitzhak Rabin, who spoke at the 1968 UJA Inaugural Dinner at the Americana Hotel. 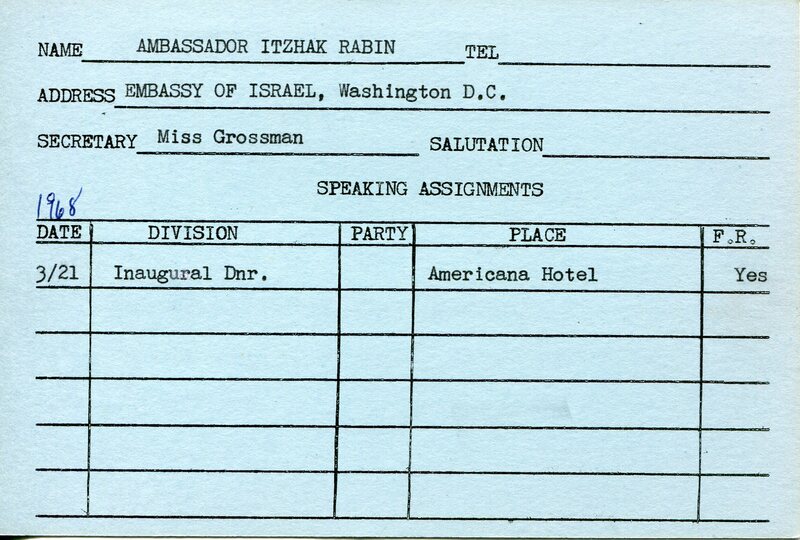 Yitzhak Rabin’s speaker’s card, 1968. He spoke at UJA’s inaugural dinner that year, at the Americana Hotel, not far from the UJA office, on March 21. Note on the Americana Hotel: According to Wikipedia, the Americana of New York was completed in 1962 at 7th Avenue between 52nd and 53rd, and built, along with the New York Hilton nearby on 6th Avenue, to serve the huge number of tourists attending the 1964 New York World’s Fair. The hotel was constructed by Laurence Tisch and his brother, interesting because Laurence held many leadership positions at UJA; in 1971 he was Campaign Chairman with Meshulam Riklis. One can only hope that UJA was able to negotiate competitive prices for the events they held at the Americana. In 1979 the Americana became a Sheraton Hotel which it remains today. Other speakers in the file were not as well-known but were leaders in Israel, and were available to speak to smaller groups. Ruth (Mrs. Moshe) Dayan spoke to the Women’s Division at a rally at the Americana. H.E. Yosef Tekoah, Ambassador of Israel to the United Nations spoke at a number of lunches and dinners, including an informational lunch with the Campaign Cabinet (a rare event that did not include fundraising), at the Night of Stars gala at Madison Square Garden, and at several Person-to-Person lunches at UJA headquarters. The file appears to be a planning file, with final documentation no doubt having been completed and retained by the PR dept. Unfortunately, although the collection contains many boxes of UJA photographs from this period, no related subject files have been found. Many of the UJA photographs document events from 1968, and an interested researcher could match them up with Henry C. Bernstein’s subject files like this “Appointments” file, but none of the corresponding files from PR appear to be part of this collection. The vast majority of PR material in the collection is from Federation, as has been reported in previous posts. Processing is complete for all of the UJA files brought in from storage to date, but we continue to hold out hope that more will turn up in boxes we have yet to look at. Very few records have survived as part of the UJA-Federation of New York archives project. There were many opportunities over the years before the merger for UJA to have moved, lost or otherwise disposed of their inactive records. The files that do exist seem to have been moved by UJA staff members who assumed Joint Campaign positions, from the UJA offices at 220 W. 58th street to the Joint Campaign offices in the Federation building soon after the official start of the Joint Campaign in 1974. Once in the Federation building, files would have come under the auspices of the Federation records management protocol, were eventually sent to off-site storage, and became part of our archives project. As for the UJA files that were not moved in 1974 to the Federation building, a far greater number of boxes, their fate is still unknown. 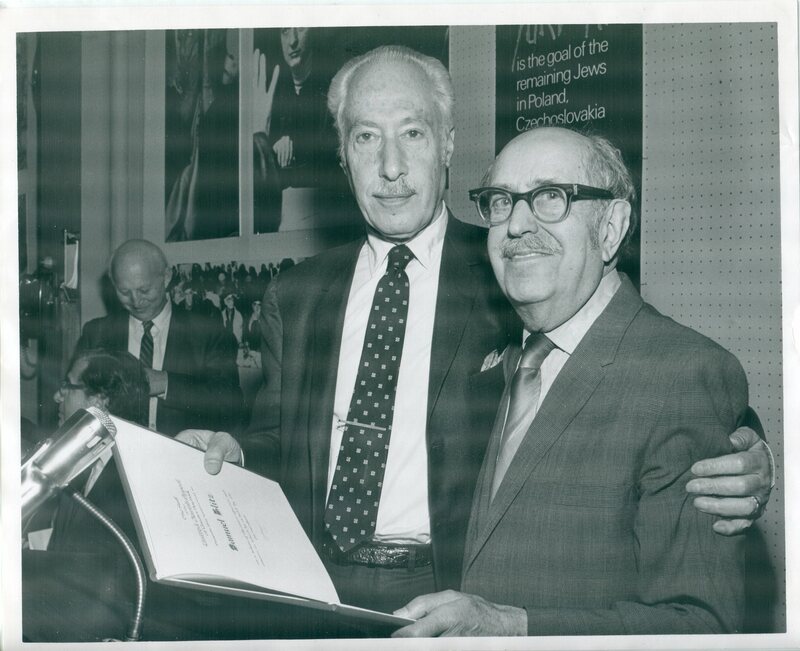 The largest series of UJA files that we have found so far belong to Henry C. Bernstein, who was the Executive Vice-President (EVP) of UJA of Greater New York, Inc. from about 1942 through 1970. Samuel Blitz is listed on UJA letterhead as Executive Vice-President together with Bernstein, for most of the 28 years Bernstein served in that position. Because his files have not surfaced, it is unclear what his role as co-EVP was, and Bernstein overshadows him because at least some of his work is documented and Blitz’s is not. Bernstein had been Campaign Director for UJA in addition to EVP, and may in fact have concentrated on fundraising as EVP. (Perhaps Blitz and Bernstein mirrored Hexter and Willen at Federation, sharing the EVP position, with Willen in fundraising and Hexter in a more administrative role). In any event, Blitz retired in 1965 and Bernstein chose to transfer his energies in 1971 to UJA fundraising and devoted the next ten years at UJA to raising funds for the Israel Emergency Fund, the Israel Education Fund, and in matching donors with special projects in Israel in conjunction with the Jewish Agency, the JDC and other organizations with similar missions as UJA. His files end in 1980. Following Bernstein in 1971 as EVP was Ernest Michel, the subject of a post on this blog last year. skip the 1950s entirely and only pick up again in 1968. 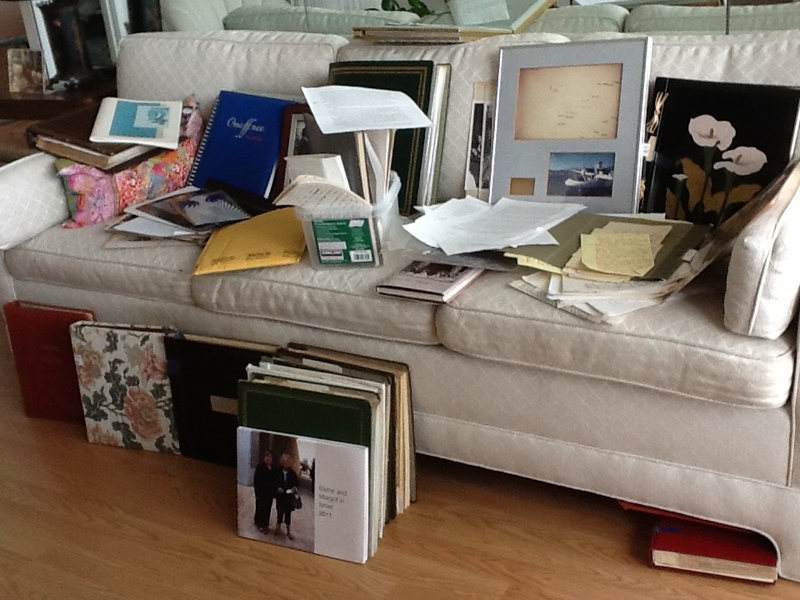 The best coverage of his years as EVP are his 1968-1970 subject files. I can only guess that he chose to keep these more recent files with him when his office moved, or perhaps those were already the only files remaining in the UJA building. His fundraising and project files for 1971-1980 exist almost intact (1976 is missing entirely), and serve as a good record of those years. In the near future I hope to post a blog about the UJA office building itself at 220 W. 58th Street. 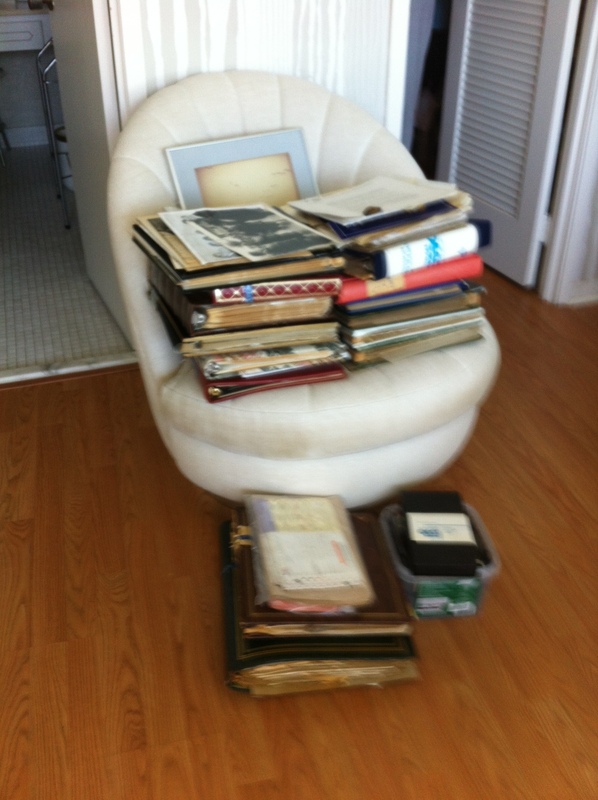 I will look for any evidence of what may have happened to the files as I go through the one existing box of administrative files from the 1940s-1960s. 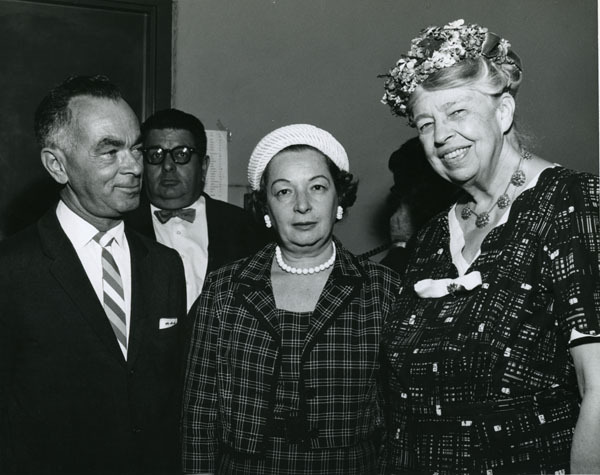 This image of Eleanor Roosevelt attending a United Jewish Appeal “Person To Person” event in 1960 is from a recently processed 20 carton group of UJA photographs containing approximately 18,000 prints and occupying 24 cubic feet. The vast majority of prints are black and white 8 x 10 inch prints, though some prints of smaller sizes, a number of negatives and a few slides are also included. The date range of this group is from the late 1940s through 1973. The photos are primarily organized chronologically and then alphabetically according to division, event, or community name, though some files on the Joint Distribution Committee, on Keren Hayesod, and on the state of Israel are included among the late 1940s boxes. The majority of images show posed group portraits or candid views of agency board members, agency executives, and celebrity guests attending special events and fundraising parties. A few famous names included in the group of photographs are: Nelson Rockefeller, New York City Mayor Abraham Beame, Eddie Cantor, Danny Kaye, Shelley Winters, Gerald Ford, Moshe Dayan, Eleanor Roosevelt, Hal Linden, Golda Meir, Joan Rivers, George McGovern, David Ben-Gurion, and George Romney. Before sending this sub-series off to storage, I selected a few samples and digitized them. We have uploaded these dozen images as a Flickr set, visible here.